Advertising Agency Searches and New Business Pitches: An Interview With Darren Wooley - Peter Levitan & Co.
Australia’s Darren Woolley On The Art And Science Of Advertising Agency Searches and New Business Pitches. Whether or not your agency will ever be included in a search run by an agency search consultant, experienced search experts can help us all better understand elements of the search process and how clients select agencies. To get an expert opinion on how search consults work, I turned to international search consultant Darren Woolley of Australia’s leading search firm TrinityP3. TrinityP3 is an independent strategic marketing management consultancy based in Melbourne, Australia. It works across continents and has 40 of Australia’s top 100 advertisers using its services. The company assists marketers, advertisers, and procurement with agency search & selection, agency engagement & alignment, and agency monitoring & benchmarking to ensure maximum performance in efficiency and effectiveness of their advertising and marketing budgets. Darren started as a scientist, got into advertising as a copywriter, and ended up a creative director. 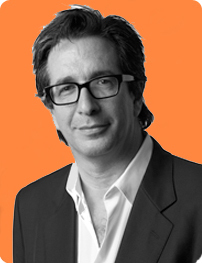 After 15 years in advertising, he realized when marketers and their agencies work well together, amazing things happen. He established TrinityP3 in 2000 as an independent marketing management consulting company that provides marketers and advertisers with benchmarks, training, and advice on how to maximize the value of their marketing budgets. PL: What are the primary benefits that you offer your clients? Darren: We provide intimate industry knowledge, independent advice, and proven methodology in assisting marketers and advertisers to select, manage, and remunerate their full roster of agencies to maximize the value of the budget. PL: Since agency compensation is such a hot topic, can you tell me how agency search consultants are remunerated? Is there a standard fee? Darren: We charge a fixed fee to the advertiser for the particular service they require. This is a fixed fee and not reconciled against head count hours, but instead a successful outcome. Unlike some consultants, we do not charge fees to agencies. We do not charge success fees or sign up fees or any fees at all to any agency. We also guarantee the outcome, by offering to rerun the pitch if the selected agency relationship does not last 12 months. In 14 years, we have only had to do this once. PL: Do you have an optimal agency search system? Do you always do an RFI, RFP, and chemistry meetings that lead to the selection of a shortlist? Darren: We offer a range of methodologies in running a pitch, from our “pitch in a day” process to a fully managed “tender process”. There is not one process to suit all. Instead, we work with the advertiser and procurement to customize the process to deliver the successful outcome required. It means we can work with all processes with experience and expertise in every process type. PL: How long does the selection process usually last? Darren: The process can be as short as six weeks for the “pitch in a day” process or up to 5 months for a multi-country, multi-disciplined tender process. The length of the process will depend on the scope and require- ment of the specific project. The important thing in regards to time is to develop and agree a timeline up front, and make sure all stakeholders, including the participating agencies, are informed of this timeline at each stage of the process. PL: What percentage of your searches now include procurement? Darren: About two thirds of searches now include procurement. PL: How do you build your database of agencies? Darren: We have an online database on our website. Here agencies can create their own login and profile, which is free and totally secure. The TrinityP3 agency register has profiles of a full range of agency types from media to social to digital to public relations and sales promotion and more from across the APAC region and beyond. Agencies from anywhere in the world have the ability to register here, and there are more than 12,000 agencies, of the various types, currently registered with us. We use this register to stay up-to-date across the industry players. PL: I assume that you get a lot of incoming from agencies. How could a small to mid-sized agency get your attention? What attributes should they have before they bother making contact? Darren: Interestingly, we have noted a change in the marketing mix. Even advertisers from multinational companies with a global or regional agency alignment are increasingly interested in small to mid-size agencies to improve and often compensate for deficiencies in the aligned agency. Therefore mid-sized agencies with particular strengths are increasingly important and in demand in the agency mix. As are smaller agencies that can articulate and prove a core specialist competency which makes them distinctive from others. This is a real benefit. PL: Are awards important to your clients? Do they help them make decisions about the subjective nature of advertising? Darren: The short answer is awards are generally not important to clients. Certainly there are a few of our clients that would select an agency based solely on awards won. Effectiveness awards have some credibility, but the winning of awards is more about substantiating other attributes of the agency than being a differentiator in its own right. PL: Do your clients usually ask for spec creative? If so, how often does that work eventually get used? Darren: We recommend that an advertiser never ask for speculative creative. In less than 10% of pitches we will ask for creative, but our preferred model is to use strategic workshops between the advertiser and the agency as a way of determining the agencies capabilities, chemistry, collaboration, and creativity. Where speculative work is asked for, it is usually to visualize the strategic solution developed in the workshops so that it can be shared with other internal stakeholders who did not participate in the workshop, such as the CEO or even the board. PL: Many agencies tell me that they do not know what other agencies are in the pitch. What is the point of this cone of silence? Darren: We do not release the list of agencies for a number of reasons. First, because the agencies sign a non-disclosure agreement, and we believe this applies both ways, so we should only release the names of the participating agencies with their permission. Second, we have had situations where the list was released, and agencies have felt it more important to compete against the other agencies rather than focus on solving the advertiser’s requirement of selecting the best agency. This has included spreading rumors about their competitors in the process to directly making allegations against other agencies. PL: They also tell me that they often don’t know what individual clients will be in the final presentation. What is the reason for anonymity? Darren: We always inform the agency of who will be attending from the client for the chemistry meetings, workshops, and presentations. Likewise we ask the agencies to provide the same information on who is attending from the agency. We believe this secrecy is counterproductive and not conducive to creating an open and fair selection process or establishing a productive and sustainable advertiser / agency relationship. PL: Some agencies spend tens and even hundreds of thousands of dollars on pitches. Is this crazy, or is it what it takes to win? Darren: It is crazy investing hundreds of thousands of dollars on a pitch if the account is worth only a hundred thousand dollars. This is a business decision, and agencies must make the decision on whether to pitch or not and how much to invest in the pitch based on their best assessment of the value and the chance of winning the business. If this is a multi-million dollar piece of business, then investing a hundred thousand dollars to increase your chance of winning the business could be a good investment. But to be honest, if the process is run correctly, then usually this is not required to select the best agency. PL: I’d imagine that by the time you get to a short list, any one of the agencies could do great work for the client. What have been the presen- tation factors that have helped you make the final decision? One of our success factors is that the advertisers find it hard to make a decision because all of the agencies were excellent. This means we have made a good selection and recommendation. But interestingly, what wins pitches is often the least manageable of all – human chemistry. Do these people share our values? Can we work productively together? Do we trust each other? Beyond capabilities, experience and expertise, this is the deciding factor. PL: Conversely, are there any standard presentation blunders that agencies make – over and over? Darren: Agencies make many blunders, and we have shared many of these on the TrinityP3 blog as a way to inform and teach agencies on how to avoid these. The biggest and most common, and it goes directly to chemistry, is spending all your time talking about yourself and not engaging the advertiser in discussion or conversation, or not listening to what they are saying because you are too absorbed in yourself. Believe me this still happens more often than you think. PL: What makes a great leave behind? Does having an expensive ‘creative’ leave behind make a difference? Darren: Clarity, relevance, and interest. Make it clear. Make it relevant. And create interest in what you have to say using all you have at your disposal as a communications professional. Too many agencies waffle. Make the layout and copy difficult to read. Use design to make it look ‘creative’ but are difficult to read. Or the agencies spend a fortune dressing it up. A mud pie with frosted icing on top may look nice, but it is still a mud pie. PL: Any other thoughts that can help agencies better mange their pitch processes to win more pitches? Darren: My advice to all agencies is “pitch less and win more”. Do not participate in a pitch just because the opportunity is provided to you. Assess that opportunity to determine if it is right for you. This means when you are offered a pitch opportunity, take the time to interrogate the opportunity with questions about process, size of project or contract, and expectations. If you do not get the answers you want, then do not pitch. Next look at your existing clients. Do you have the time and resources to participate in the pitch without a negative impact on the current clients? Finally, if you are successful, is this the type of advertiser you would want as a client? Because if you answer no to any of these questions then you are better off withdrawing respectfully as another opportunity will come your way. Ah… “pitch less and win more”. This interview is one of 14 expert interviews in my book “The Levitan Pitch. Buy This Book. 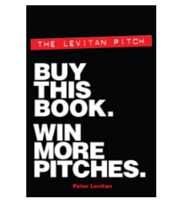 Win More Pitches.” You can buy it on Amazon right –> here. One of the tools that you will find in the book is my “Go Quiz” which should help you — PITCH LESS — by helping you to make the important decision to pitch or not to pitch the prospective client based on sound decision making. This entry was posted in Book, New Business, Pitching and tagged ad agency, book, new business, Pitching. Prominent words: agencies, agency, agency search, chance of winning the business, darren, darren woolley, experience and expertise, marketers and advertisers, maximize the value, now include procurement, pitch, pitch less and win, pl, process, search, searches now include, searches now include procurement, win more pitches, winning the business, work. Bookmark the permalink. Trackbacks are closed, but you can post a comment.